Sir Clinksalot wrote: Apparently the books below are a prop in the new Princess Fairytale Hall. I've heard at least one person complain that the books should not be in their original (non English) languages because the theme of MK is "Americana". I totally disagree. Fantasyland isn't Americana at all. Last I looked we don't have castle's like you'd see in the middle of the park, Snow White, Peter Pan, Beauty and the Beast, Little Mermaid, etc, AREN'T American stories. Anybody have a problem with this or is this yet another overraction by Disney nerds? People are seriously complaining about the books being in their original language? I find that to be a great touch and a nice way to stay true to the source material. LOL, there isn't even a question. Its in theme and they are crazy (and wrong). ^Disney Fans crazy? And wrong!?!? Who would have ever guessed such a thing! SharkTums wrote: ^Disney Fans crazy? And wrong!?!? Who would have ever guessed such a thing! Hahahaha, some are more level headed then others. Disney Magic has failed them. It is a sad, sad day. The train looks absolutely fabulous. Today, Disney Vacation Club announced that its planned next location will be at Disney's Polynesian Resort, located on Seven Seas Lagoon at Walt Disney World Resort. When this resort is completed, Disney Vacation Club will have destinations at all three resorts on the monorail system, allowing easy access to Magic Kingdom Park. The planned development project at Disney's Polynesian Resort, when completed, will join Disney Vacation Club's 12 other properties, including The Villas at Disney's Grand Floridian Resort & Spa, scheduled to open Oct. 23. Construction on the Polynesian project began this month, and completion is estimated to be in 2015. In addition to the Disney Vacation Club project, other guest areas within Disney's Polynesian Resort will undergo refurbishment. More information and project details will be shared at a later date. Disney Vacation Club debuted in October 1991 with a flexible, vacation point-based model rather than the traditional fixed-week timeshare model. Disney Vacation Club is approaching a total of 200,000 member families from all 50 states and approximately 100 countries who have discovered the joys of membership. Disney Vacation Club members are able to choose from among a variety of vacation destinations, including a stay at any Disney Vacation Club Resort or at more than 500 other destinations around the world, and when they purchase directly from Disney, members also can take trips on one of the Disney Cruise Line ships or guided vacations with Adventures by Disney. Additionally, vacations at a Disney Vacation Club Resort can last from one night to several weeks. For more information about Disney Vacation Club, visit http://www.disneyvacationclub.com. I agree, maybe it will inspire some unsuspecting little one to read the original stories and see how gritty and screwed up they were, pre-Disney sanitizing. 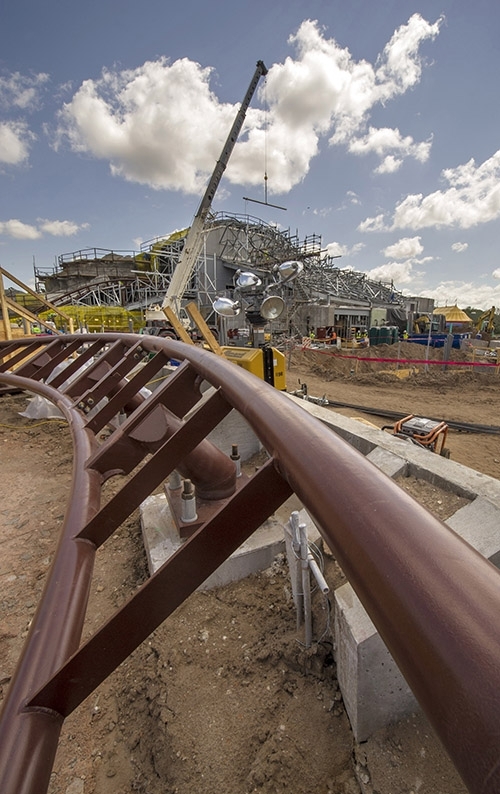 Here is the full chat log about the mine coaster from the Parks Blog. Its a good read if you have a moment. There is stuff about the Princess Fairytale Hall that I did not include. Jenn Fickley-Baker: A lot of our readers are asking if there’s an update on the opening of the Mine Train. Any idea? Dave Minichiello: We’re looking at 2014 and we haven’t set a date yet. Jenn Fickley-Baker: Got it. But I understand your team did hit a milestone on mine train construction earlier today, in fact. What can you tell us? Dave Minichiello: We began push/pull testing. This was a major milestone that we achieved today. 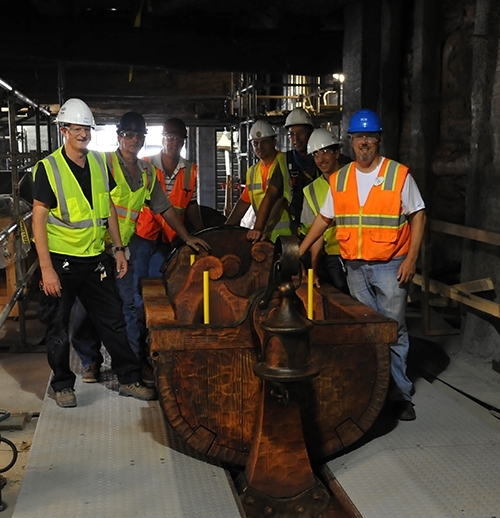 It allows the ride team to start moving the ride vehicle by hand, zone by zone, through the attraction. Dave Minichiello: If you’re at Magic Kingdom Park, be sure to take a peek through the construction window to possibly catch a glimpse. That will be ongoing now. Dave Minichiello: They’ll swing freely from side to side. We’ve developed a new ride system that allows each car to swing independently. Dave Minichiello: We drew inspiration from the classic scene in the film “Snow White and the Seven Dwarfs.” So looking at the mine car from the classic film, we drew inspiration for our actual vehicle. Jenn Fickley-Baker: I think we have a previously released video that might be a good visual to share to demonstrate just what you’re talking about. Dave Minichiello: There will be two guests sitting side-by-side, so four people per car. Dave Minichiello: The Mine Train is developed as a family attraction, so the majority of the family should be able to ride. Dave Minichiello: It’s thrilling but it also combines the best of our classic dark rides. You go both interior and exterior in this attraction. There are some classic Disney dark ride scenes. Jenn Fickley-Baker: Kimberly from NJ asked about wheelchair accessibility. Any update on that? Dave Minichiello: Yes, guests traveling in wheelchairs will need to transfer, and each coach will have a transfer-accessible coach. Dave Minichiello: The height restriction is 38 inches, which is typical of a lot of our attractions. Jenn Fickley-Baker: Let’s talk about how Mine Train will fit in with the rest of New Fantasyland. Jenn Fickley-Baker: Courtney from NE asked, ‘What techniques have you had to use to make sure the Mine Train blends in seamlessly with New Fantasyland? How exactly do the Imagineers do such a great job transitioning from a French village to a Denmark sea castle to a German mountainside?’ How will you accomplish this visually? 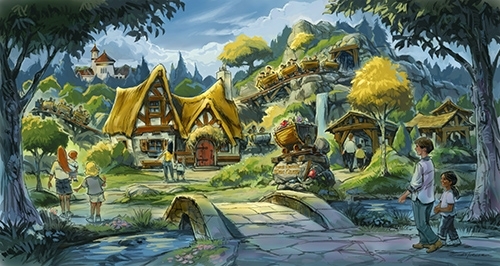 Dave Minichiello: Mine Train is the centerpiece of New Fantasyland. It’s the final piece in the overall construction and what’s dynamic about it is that it’s centered in the land. Dave Minichiello: It’s one of the only attractions we have in the park where you can walk around 80% of the attraction and look into it. What’s really fun is that guests both riding and viewing will have fun watching the attraction. The attraction will create a really amazing kinetic element in the center of the land when you can picture a number of ride vehicles on the track going around at the same time. All the way around it, including the mermaid side, the attraction has a little bit of the flavor of the attraction that’s opposite it. Jenn Fickley-Baker: How will the storyline of the Mine Train be different than Magic Kingdom's previous ‘Snow White’ attraction, Snow White's Scary Adventures? Dave Minichiello: The Mine Train is the story of the dwarfs. So it’s going into the dwarfs’ world, but still has characters from the classic films, including Snow White. Because you are in the dwarfs’ mine, you are in their world. Dave Minichiello: The overall adventure is about the interior and exterior. You do go through a number of scenes that are interior and exterior for the storytelling experience. Dave Minichiello: The storyline is from the dwarfs’ perspective, although there are special appearances - cameos - from other key characters within the film. Just be careful who you take apples from! Jenn Fickley-Baker: Our reader Patricia also had a good follow-up question, which is, ‘I’ve seen a pretty little cottage in concept art for the ride and have spotted the steel shell of it being built now…and I wonder if that will be a building that guests walk through to get onto the ride.’ Can you tell us? Dave Minichiello: The cottage appears as an iconic show element within the whole mine train attraction and you will be able to look into the scenes and you see it in the distance as you approach the mine. Dave Minichiello: We’re really excited about the new technology that we’ve used in this show, but keep your eye out for old favorites. Jenn Fickley-Baker: Thanks again, Dave, for taking part in our live-chat today. Jenn Fickley-Baker: As a reminder you can revisit this chat at any time and click 'Replay' to review all the questions and answers.